Heritage Railroad – 3 foot Narrow Gauge Locomotive / Products and Services. Rare 1920’s built Boxcab Locomotive is saved by the McHugh Company. Heritage Railroad and Rail Trasporation Museum 3 Foot Narrow Gauge Products and Services. Sales of rebuilt 3 foot narrow gauge diesel electric locomotives. 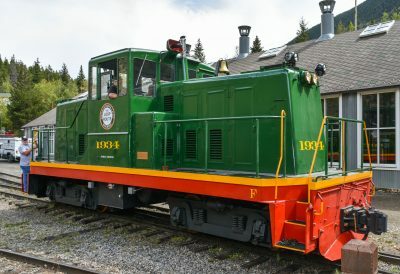 Restorations of vintage 3 foot narrow gauge locomotives powered by gasoline or diesel engines with either electric traction or mechanical drive systems. The McHugh Company offers several 3 foot narrow gauge diesel electric locomotive models to meet the requirements of traveling over lite rail or to provide motive power for heavy tonnage trains. We will also work with your organization to supply a locomotive that will fit the budgetary constraints of your railroad museum or tourist rail line operation. The McHugh Company has also preformed repairs or restored various manufactures of vintage 3 foot narrow gauge locomotives at railroad museums, heritage tourist rail lines, and at our facility. McHugh – 45 to 50 ton, 3 foot narrow gauge diesel electric locomotives have four axle wheel sets with two truck assemblies. 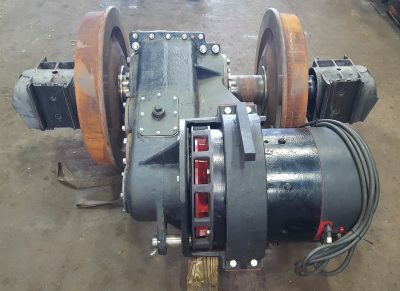 Both of the truck assemblies each have: one axle wheel set with a reduction gear box connected to a traction motor with a chain sprocket and the other axle wheel set has a outer chain sprocket. A drive chain connects to both axle wheel sets with the drive axle wheel set providing power to the other axle wheel set in each truck assembly. There are two rebuilt diesel engines that are mounted to two rebuilt generators to provide electrical power for the traction travel circuit. The units have full width cabs that provide ample space for two people to be seated in the locomotive. The locomotive’s track travel speed is approximately 15 MPH with a standard gear ratio on level track. As an option gear box with higher gear ratio can be provided to achieve a speed of approximately 20 MPH. However it shall be noted that actual travel speeds with either ratio gear ratio will vary depending on the railroad grades and weight of train consist. McHugh – 65 & 80 ton, 3 foot narrow gauge diesel electric locomotives have two truck assemblies with four axle wheel sets. All four axle wheels sets are directly powered by a rebuilt traction motor and a rebuilt gear box. The units have two power plants, with a rebuilt diesel engine connected to a rebuilt main generator that provides electrical power for the traction travel circuit. All new electrical components and new parts are also supplied with these units. The two truck assemblies are reconditioned with new wheels and roller bearings. The locomotive’s track travel speed is approximately 15 MPH with a standard gear ratio on level track. As an option gear box with higher gear ratio can be provided to achieve a speed of approximately 20 MPH. However it shall be noted that actual travel speeds with either ratio gear ratio will vary depending on the railroad grades and weight of train consist.